Commercial EPC Tiverton – if you are require an EPC in or around the Tiverton area, then please get in touch and we will be happy to provide you with free advice and a no obligation quote. If you are letting or selling a non-domestic property in Tiverton, then you will most likely need a commercial EPC to accompany the marketing details or at exchange of contracts. There are a handful of exceptions so please contact us to double check. Up Energy works with property professionals, individual property owners and local business in the Tiverton area and have been carrying out EPC surveys since September 2008 when the Energy Performance Certificate legislation was introduced. In Tiverton Up Energy frequently undertake EPCs on units on the industrial estates of Howden and Old Market Field, as well as commercial EPCs on the many retail units in Tiverton town centre. 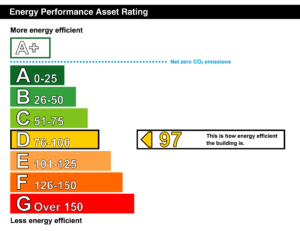 Essentially an EPC (Energy Performance Certificate) for a commercial building provides a carbon efficiency rating based upon the following systems installed in the building: Heating, hot water, lighting, ventilation, insulation and any on-site renewables if installed. The services information is checked against the activity types within the building such as office, retail shop, workshop, corridor, wc etc. The resulting EPC provides a rating of A to G, with A being the most efficient and G being the least efficient In 2018 new Minimum Energy Efficiency Standards (MEES) are coming in requiring all newly let buildings to require an EPC rating of E or better. We can offer advice and help for the best way to achieve this if your building is struggling. Why choose Up Energy for your commercial EPC Tiverton? 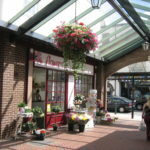 Contact us today for a commercial EPC Tiverton, we are on hand to help. If your property is not in Tiverton, we do serve the whole of the south west and beyond, including local towns such as Crediton, Cullompton and Wellington to name just a few.